We Are One... Ko Tatou, Tatou - these words say so much in light of the tragedy that occurred to our Muslim community, our city and our country on the 15th March 2019. I received many personal requests in support of creating a memorial piece like I did post earthquakes. I have decided to make my green peace doves to help pass on Peace and Love to those hurting and needing a reminder of hope. They are MADE TO ORDER at this stage with a donation to TWO charities of your choice below. It was in my heart immediately to create something to give back but wanted to be sensitive - a couple of days after the terrorist attack the words 'We are one' visually came into my mind, literally stopping me in my tracks as my heart was grieving for those lost. 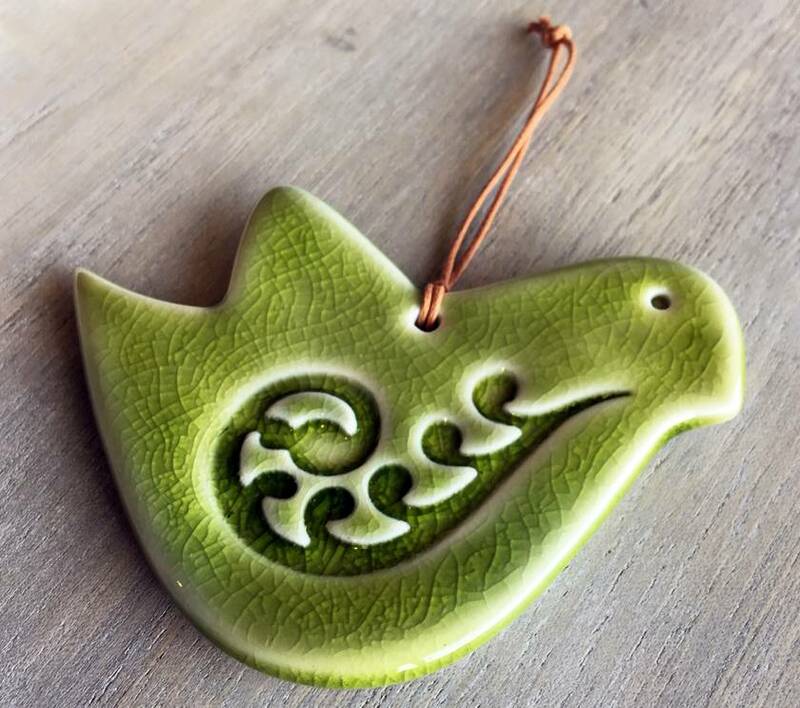 The Dove features a Koru and green crackle glaze - the green Koru symbolises new life, growth, strength and peace. My hope and prayer is that as our city moves forward together from this tragedy, with a feeling of solidarity, care and love as ONE people. Images will be updated ASAP. 2/ CVOC - Christchurch victims organising committee. They are doing a wonderful job directing funds, food, support and food exactly where needed within the Muslim community. They are on the ground in amongst the families and working so hard, I had the pleasure of meeting some of these lovely people. I will also be creating a 50 piece Ceramic Memorial which I will be donating in honour of the 50 beautiful souls taken. The doves are made from New Zealand porcelain clay, all pieces are individually handmade & stamped 100% by myself. This hanging dove measures approximately 8.5cm x 6.5cm tall and is very light if you are wanting to post overseas. 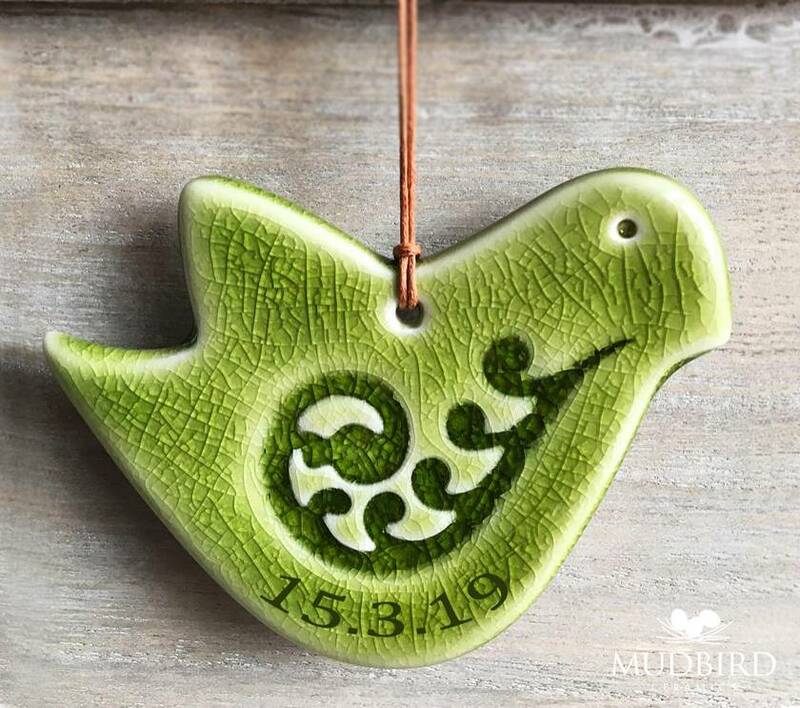 All designs/content copyright of Gill Weavers / Mudbird Ceramics 2019. If collecting this will be by appointment from my studio space at: The Exchange, 376 Wilsons Rd, Waltham Christchurch.